Can you recall the last time we were on the precipice of revolutionary technological change? Something that would alter the way we do things – permanently (or at least until the next BIG thing comes along)? I can remember a time before personal computers, DVRs (but not VCRs), remote controls that weren’t “remote” (and still attached to TVs), Walkmans® (not MP3 players)…and Google. In the immortal words of Ralphie Parker: “FUUUUUUUUUUUUUDGE.” Had I taken that stock tip, I’d be on an island somewhere – and not discussing mobile exclusivity with you fine folks. And that brings us back on topic: Mobile Exclusivity. With an increasing number of consumers gravitating toward smartphone and/or tablet ownership, it should come as no surprise that these devices are becoming the preferred – and sometimes the only – source for tasks that were previously undertaken on a good old laptop or desktop. Nonetheless, the number of mobile owners doing so is still staggering. According to our latest Prosper Mobile Insights survey of 331 mobile owners, half (51.1%) say they only access their email via device. Nearly as many (45.3%) conduct Internet searches exclusively on their smartphones or tablets, while two in five (42.3%) say they are mobile-only when it comes to updating their Facebook pages. Mobile owners are slightly less committed to exclusive mobile access for online banking (29.6%) or online shopping (25.4%) – for now. 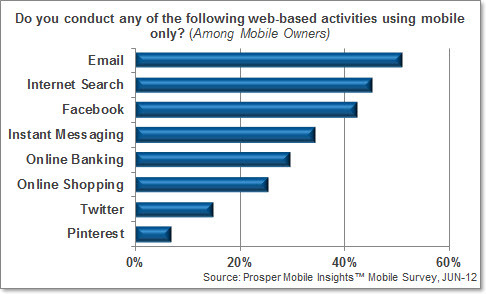 All told, seven out of ten mobile owners conduct at least one web-based activity using only their devices. 1. 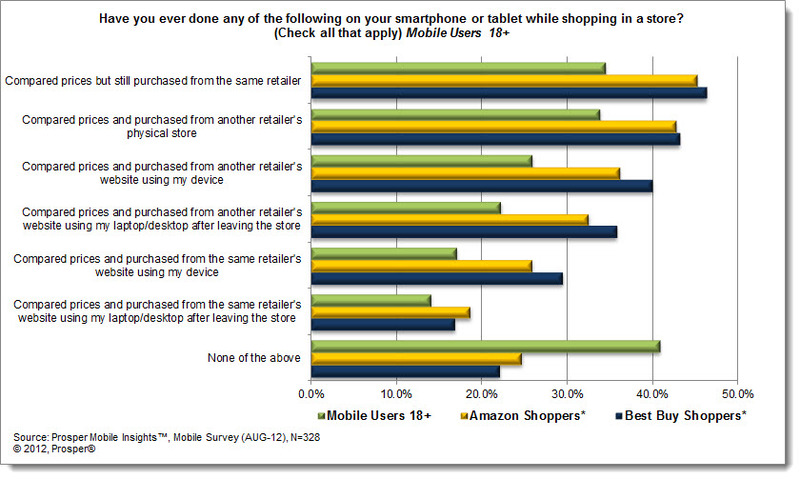 Are your customers even mobile? If you’ve kept up with BIG, you may have heard us mention our Mobile Aptitude Score, a unique index which considers mobile ownership, usage, influence on purchases, and frequency of mobile Internet access. By assessing the scores for various shoppers, we found that some retailers are more likely to have “more mobile” customers (i.e. Nordstrom, Macy’s, Apple) compared to others (like JC Penney, L.L. Bean, even Radio Shack). While mobile adoption may grow among “underperforming” retailers, you have to ask yourself if it’s worth dipping into the mobile pool if it’s not going to make a splash with your core shoppers. 2. How long can this last? I teed up this question specifically for marketers and advertisers – as I think we all can agree that mobile is the way to go technology-wise, at least until skin implants harness our telekinetic brain waves or ESP or something [and I’m not even sure that makes sense]. More specifically, how long will it be before mobile users feel inundated by ads (banners, pop-ups, sponsored, videos, or otherwise), turning them off from buying your products or using your services? In this same survey, we found that two out of five (42.9%) mobile owners are more likely to pay attention to a video versus a standard ad on their mobile device – that’s a seemingly big audience. Among these respondents, half (51.3%) reported that videos were more attention grabbing, 34.5% admitted they were more enjoyable, while a quarter (25.2%) felt that they are more relevant. It’s important to note, though, that 30.4% simply stated that they are unable to click away from videos until at least part of the advertisement had played. Not unlike watching a commercial on TV, right? That is, until VCRs gave us the ability to “buzz” the ads, which evolved into skipping commercials in real time, courtesy of DVRs. So, it may just be a matter of time before the next Gates/Zuckerberg/Google wannabe invents an app that wipes out ad content on your mobile device. Perhaps the key to mobile advertising is thinking outside the box. Will we be slicing through Dole® bananas on Fruit Ninja in the near future? If James Bond can drain a Heineken, I guess anything’s possible. 3. Is this worth it? You can spend all you want on mobile adaptation and/or advertising, but if browsers aren’t converting to buyers, is this worth your company’s expenditures? Again, examining your customers’ Mobile Aptitude may help answer this question. Additionally per our study, mobile owners currently remain a little cool on their comfort level with buying and banking via devices, but recall the growth of online shopping – security and shipping concerns have been displaced by instant gratification, coupon codes, and a reputable crop of web-based retailers. 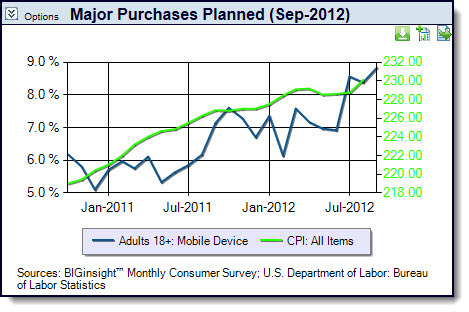 So, is it just a matter of time before mobile buying becomes the next BIG thing? 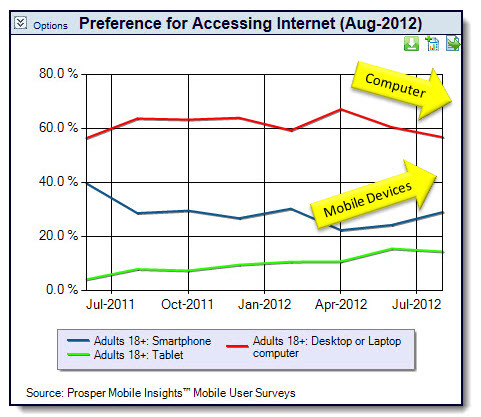 To access complimentary data from our latest Prosper Mobile Insights release, click here. 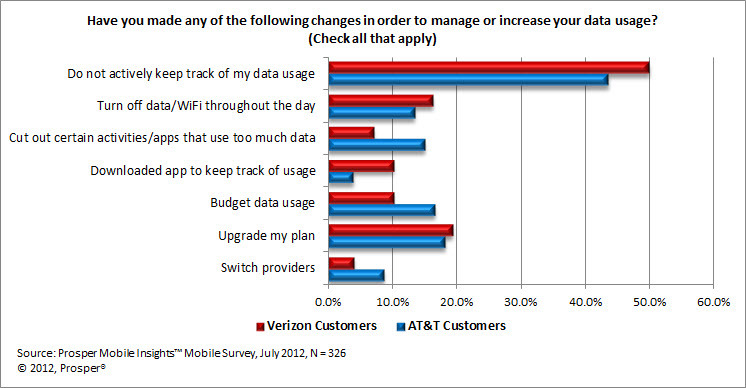 Source: Prosper Mobile Insights™ Mobile Survey (Jun-12). 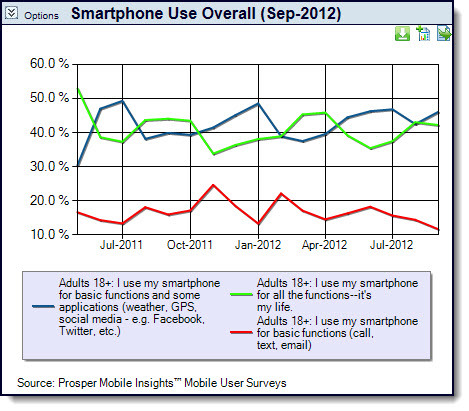 Conducted 6/19 – 6/22/12 among 331 smartphone and tablet users on their devices. Margin of error: 5.4 percentage points. BIGinsight™ and Prosper Mobile Insights™ are trademarks of Prosper Business Development Corp.